Many of us have pored over the pros and cons of various makeup brush fibers, which holy-grail eyelash curler is worth the investment, and exactly what size blending sponge is best for tapping concealer into the inner corners of our nose. But who among us has paid much — if any — attention to the mirror we pair with these well-selected tools? Talk about an oversight. Turns out the makeup mirrors of 2019 don't just help us see exactly how much highlighter we're piling on or every little chin hair (thanks to built-in magnifiers), they're also equipped to mimic natural light, play YouTube tutorials and Spotify playlists, and in some cases even reveal which skin-care products are really working. Whether you want to pony up for an app-driven smart mirror that acts more like your tablet or are simply looking for a well-designed vanity situation that will allow you to see every pore, find our best picks, ahead. 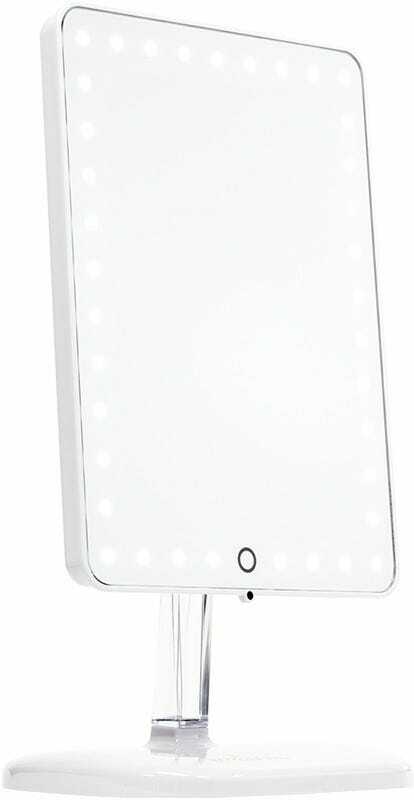 If you like listening to music or catching up on audio books as you get ready, then this LED-lit mirror was made with you in mind. It has wireless Bluetooth audio speakers that can stream whatever floats your boat, and yes , you can even make calls on it. If your friends already thought you took way too long getting ready, they had no idea what they were in for when this mirror came into your life. Though the weight and feel of the plastic base and arm could be a little more substantial for the $80 price point, we love the nifty secret function of this vanity mirror. 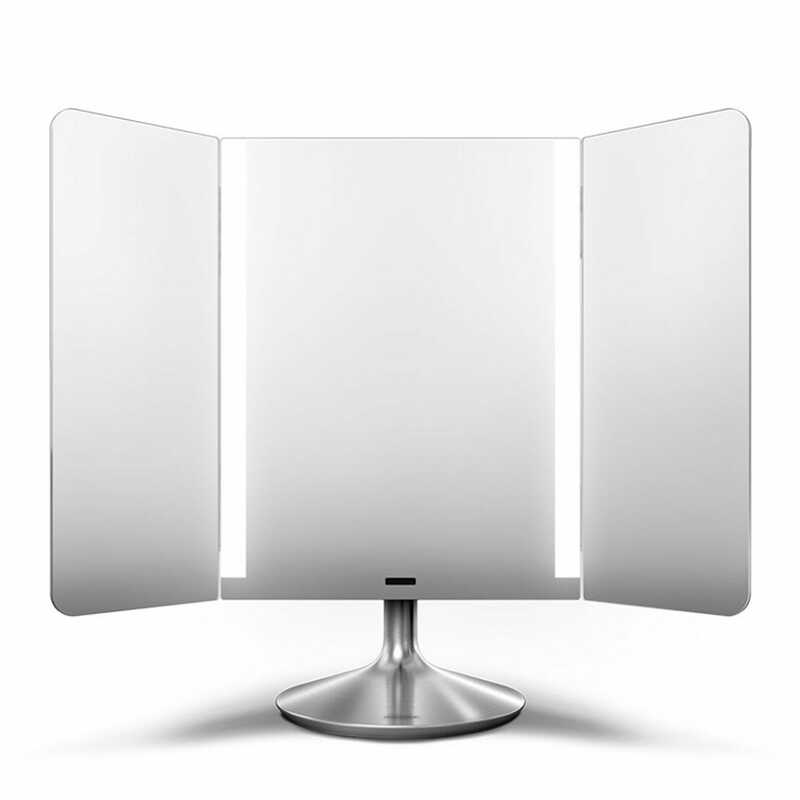 In addition to boasting three natural-light settings (including sunlight, daylight, and evening lighting), linking to a phone via an app for additional controls, and packing a built-in ring light for selfies, this baby also transforms into a deskside lamp with the flick of a wrist, making it the perfect option for tiny living spaces. 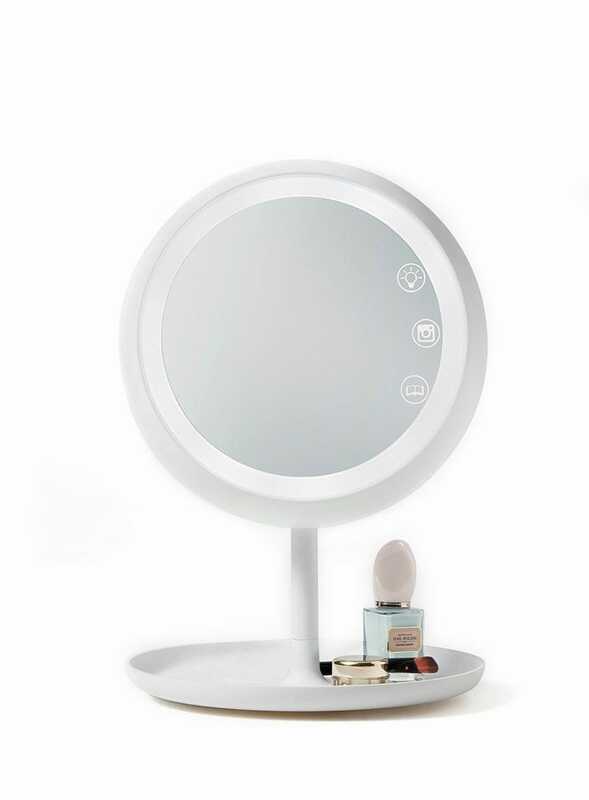 Juno & Co The JUNO Smart Makeup Mirror, $79, available at Juno & Co.
HiMirror Mini is less a mirror and more an infotainment system for your vanity. Sure, you can catch your reflection and zoom to 2 and 3x magnification with the thing, but it can also be used to play YouTube tutorials, check the weather, and catch up on the news. And those aren't even our favorite features. 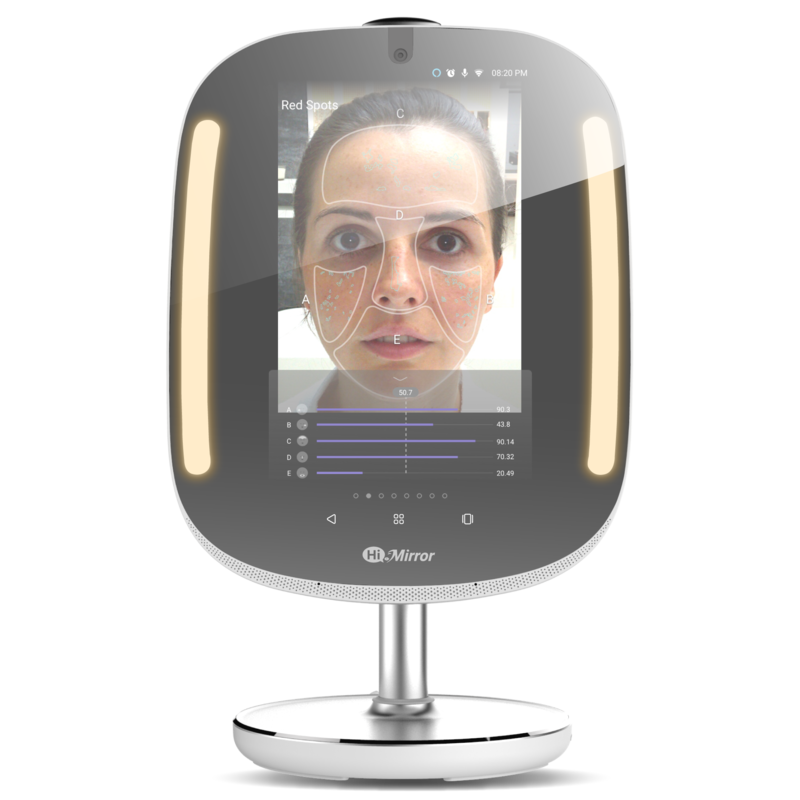 You can also use it to snap pics of your face and the skin-care products you use. It reads and records skin conditions to provide data on how tone, clarity, and texture have improved over time — so you can see which products are driving results, and which you should toss. This simple mirror doesn't have the bells and whistles you'll find in smart mirrors. But it does earn top marks from Amazon reviewers, thanks to a dual-side face (one is a 10x magnifier), minimal footprint, and weighted base (which keeps it from getting knocked off your bathroom shelf). Yes, this Alexa-enabled mirror costs as much as our monthly food budget. 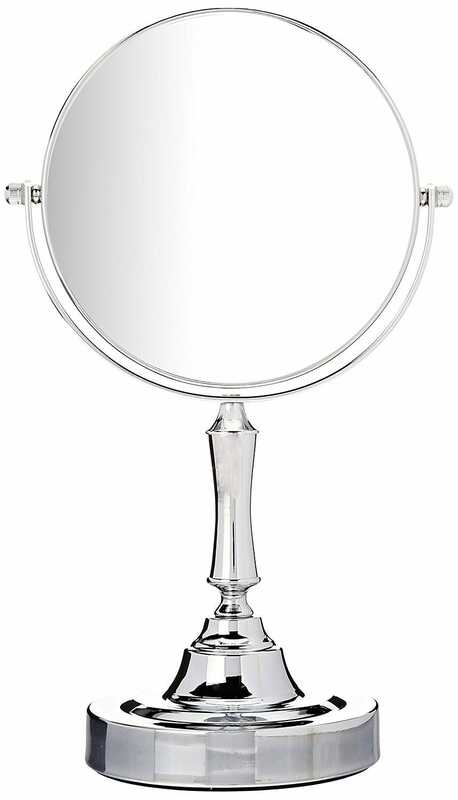 But for those looking for a vanity mirror beautiful enough to leave out, this stainless steel option is pretty compelling. Aesthetics aside, the brand poured a bunch of R+D into the lighting, which uses surgical-grad LEDs to mimic overcast days, candlelight, office lighting and more via controls in a downloadable app. 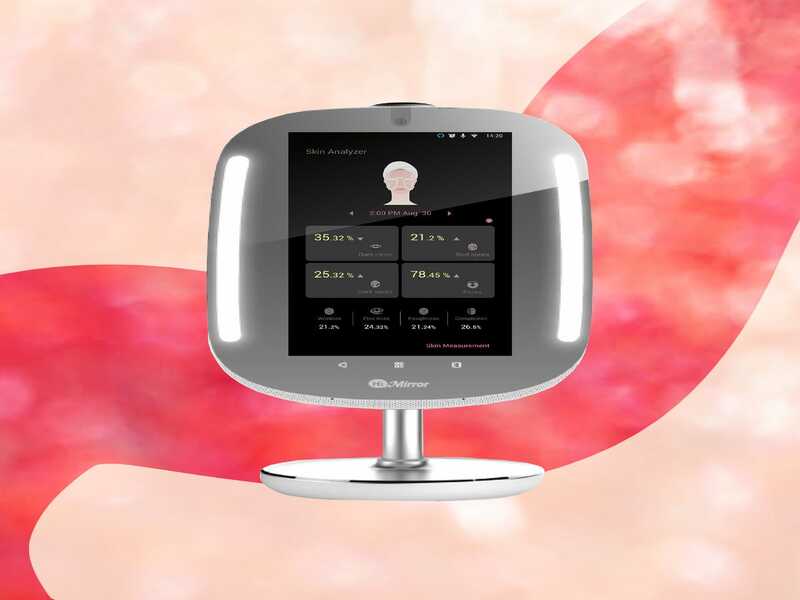 Instead of powering up the mirror with a button (and smudging its surface), a motion sensor detects your presence and illuminates light strips on the main panel perimeter. The fold-out side panels also work wonders for seeing what's really going on in the back of your head and a removable 10x magnifier helps finally answer the question: What is that bump on my bikini line?